DT skills are developed progressively. The design process is taught and children learn to make a range of finished products in accordance with their designs e.g. pop-up card or moving vehicle. 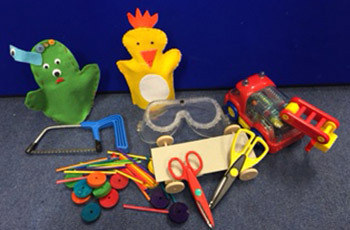 First basic skills are taught e.g scissor control, then children use a range of equipment such as saws and hole drills with different materials e.g. wood, felt. DT includes construction equipment. Autumn Puppets – Exploring types of puppets and sewing own, evaluate puppet. A Healthy Sandwich – designing a sandwich to eat as part of a balanced diet.